The Resurrection of Our Lord, Easter Day, exposes the heart of the gospel and the church year, too. It was the resurrection of Jesus Christ that made the difference in the disciples and the early Christians, changing them into bold witnesses for the crucified and risen Lord; all of the disciples, according to tradition, with the exception of St. John, died as martyrs - witnesses - for Jesus Christ. When Jesus, in the Sermon on the Mount, told them that "men (would) revile and persecute you and utter all kinds of evil against you falsely on my account," they probably didn't think much about it, but they did when the persecutions and executions began in earnest. They knew that there was nothing to fear, neither life nor death, because the Christ who was crucified had conquered death. He had promised them life in his eternal kingdom and that was enough to change them into "fools for Christ." The Easter mystery - he died on Friday and arose from the tomb on Sunday - puzzled the disciples, even after they had seen the resurrected Lord; they questioned the reality of it, at first, much as people have always done, but they accepted it and believed that Jesus had opened up the kingdom of God and eternal life for those who trust in him. They accepted the death and the resurrection of Christ as a single, unitive event, and that's the way they celebrated it, at first. Every Sunday was a celebration of the death and resurrection of the Lord, so that "Christ is risen! He is risen indeed!" echoed and reechoed in the worship of the church Sunday after Sunday, year after year. A new day had dawned for them and for all people, the Ogdoad, the eighth day, the day of a new creation. Easter tells the world that Jesus is alive and everything is new - forever. Those congregations which keep the Easter Vigil and emphasize the renewal of baptism in the Easter celebration might want to offer this contemporary collect from The Book Of Common Prayer. The prayer petition, in addition to including the resurrection and baptism, is introduced with the verb that is so prominent in Advent, stir up, reviving memories of Christmas ("this most holy night") and it calls for total renewal in the Easter worship: "O God, who made this most holy night to shine with the glory of the Lord's resurrection: Stir up in your church that spirit of adoption which is given to us in baptism, that we, being renewed both in body and mind, may worship you in sincerity and truth; through Jesus Christ our Lord, who lives and reigns with you, in the unity of the Holy Spirit, one God, now and for ever. Amen." Most of the books of worship have contemporary versions of classic Easter prayers, few, if any, of which mention the relationship of Easter, baptism, and "total renewal." The Psalm Of The Day - Psalm 118, which has different versification in the several churches that appoint it for Easter Sunday, is used on this Sunday in all three years/cycles of the church year. 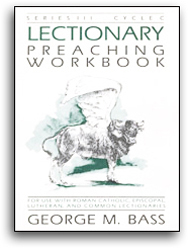 Commentary is included in Lectionary Preaching Workbook III, Cycles A and B.
transition from the Psalm to, in this case, Easter Day: "Lord God, your Son, rejected by the builders, has become the cornerstone of the Church. Shed rays of your glory upon your Church, that it may be seen as the gate of salvation open to all nations. Let cries of joy and exultation ring out from its courts to celebrate the wonder of Christ's resurrection, now and forever." Acts 10:34, 37-43 (RC); 10:34-43 (E) - By replacing the Old Testament readings for the Easter season with selections from the book of The Acts of the Apostles, the church intends to give renewed emphasis to the importance of Easter as the great 50 days of the church. These readings continue to announce the Easter proclamation and to keep it prominent in the consciousness of the faithful so that by the end of the season it will be burned into their hearts and minds forever. This particular choice reveals Peter's Christology in a sermon he is purported to have preached to Cornelius and others in Caesarea after his moving vision took him there. In the sermon, he outlines the central facts of the gospel, showing how the earthly ministry of Jesus was rejected by Israel and led to his death. He declares that the resurrection is God's way of vindicating Christ in the face of his awful death on the cross. Peter personally affirms that he and others "ate" with Jesus after the resurrection, receiving his commandment to witness about what had taken place to the whole world. In this reading, the witness of Peter and the apostles proclaims the resurrection to contemporary people, assuring the faithful that they meet the risen Christ in the meal which he began on the night before he was betrayed. Isaiah 51:9-11 (E) - The Book Of Common Prayer and The Lutheran Book Of Worship both assign Old Testament readings for Easter Sunday. The Book Of Common Prayer offers these as alternate readings, while the Lutheran Book Of Worship replaces the selections from Acts with Old Testament pericopes. This particular reading, brief as it is, sums up the exodus experience of God's people, calling upon him to "Awake, awake, and put on strength." The message has to do with the return of the exiles from their captivity, but the imagery was picked up by the Christians because it speaks so well to Christ and his Church of the Resurrection of Our Lord. Exodus 15:1-11 (L) - This selection of Scripture serves as a canticle in many of the liturgical churches; about half of the verses are omitted (for example, verse 3a, "The Lord is a man of war"), some of which refer to the exodus itself. This Song of Moses and Miriam, as it is called, is about the deliverance of the people of Israel from Egypt as a kind of act of salvation. A nation that was as good as dead became, through the mercy and power of God, alive again and hopeful of full restoration to what it was in the past. The imagery, again, points to the Easter event as an exodus for God's children from death to life. Colossians 3:1-4 (RC, E) - This reading succinctly spells out the nature of baptism as dying with Jesus and rising with the resurrected Christ; it is, at the same time, affirming the resurrection of the Lord. Once more, the ethical nature of the new life, which is central to the celebration of Lent, finds expression in the way that believers are expected to live in Jesus Christ: "Set your minds on things that are above, not on things that are on earth" is Paul's way of expressing how the new life in Christ issues from the resurrection. He also states that the final glory of the resurrection will come with the second coming, when he will gather the faithful to himself. 1 Corinthians 5:6b-8 (RC) - This alternate reading for Easter Day might be read in tandem to the other second lection. It is at once a call to repentance - "Cleanse out the old leaven ..." - and renewal - "that you may be made a new lump, as you are really unleavened." In the second place, the Corinthians are reminded that Christ, "our paschal lamb, has been sacrificed." And, third, they are invited to "celebrate the festival, not with the old leaven, the leaven of malice and evil, but with the unleavened bread of sincerity and truth." Then, Paul is saying, God can do something with you (us) and make new creatures out of the old. 1 Corinthians 15:1-11 (L); 15:19-26 (C) - The Lutheran and Common lectionaries both choose the 15th chapter of 1 Corinthians, Paul's great chapter on the centrality of the death ("for our sins") and resurrection of Jesus for Christian faith and hope, but they use different parts of it. In this reading, Paul also lists the appearances of the risen Lord - to Cephas/Peter, to the 12, to 500 people, to James and all of the apostles, and "last of all to one untimely born, he appeared to me" (an apparition which Paul did not deserve, be-cause he persecuted the church of God). It is this gospel of God's love, power, and mercy in Jesus Christ that Paul had preached to the Corinthian congregation when he had visited Corinth a few years earlier. He reminds them of this to correct the theological deficiencies and spiritual "back-sliding" that had occurred in their community. In the process, he reminds his readers in every age about the nature and content of the good news in Jesus Christ. The Lutheran lectionary begins with Paul's famous assertion, "If in this life only we have hope in Christ, we are of all men most to be pitied." His argument is simply that because Christ has been raised up from the dead, those who believe in him and know that their sins are forgiven will also be raised up to eternal life. Jesus is the "first-fruits" of that resurrection, the one through whom the longed-for hope of overcoming death in the Old Testament has finally become a reality. In time, the "last enemy" - death - will be overcome, and "all things will be put under his feet." It is then that Christ will claim his final victory, already begun by his resurrection. Christians may surely believe that gospel and base their hope in the risen Lord. John 20:1-9 (RC); 15:1-9 (10-20 - alt.) (L); 15:1-18 (C) - The Common and Lutheran lectionaries repeat the first part of Mary Magdalene's experience on that first Easter morning and conclude with Jesus' appearance to her in the garden of the resurrection (verses 11-20). Peter and "the other disciple," who had run to the tomb after Mary Magdalene had reported that the grave had been opened, "went back to their homes" not knowing what to think or believe. Mary stayed - in the ORDO reading - and, in her grief, looked into the tomb and saw two angels, who engaged her in conversation about her weeping. Before the angels could answer her "because they have taken my Lord away, and I don't know where they have laid him," she turned around and was asked the same question that the angels had asked, "Woman, why are you weeping? ", by a man she assumed to be the gardener. When he called her by name, "Mary," she recognized him. He told her not to hold on to him, but to go and tell his disciples that she had seen him. She found them and said, "I have seen the Lord." Interestingly, John does not mention their reaction to Mary's testimony. Luke 24:1-11 (E; L) - "Just Plain Nonsense." - One of the featured columnists of the (Minneapolis) Star Tribune, Jim Klobuchar, told the story of a young woman's encounter with a parking meter that was simply unbelievable. Molly Lyons parked her car next to a meter near the Metrodome, put $1.75 in it, started to walk away, heard a "clank," and discovered that the meter had fallen over, denting the right front of her new car in the process. She called the police and Officer Reinhardt, who arrived said, "I don't believe it." The superintendent in charge of the parking meters, Bill Bruneau, also said, "I don't believe it." But it happened, and despite the fact that galvanized pipe, which is not supposed to rust, is used for the parking meters in Minneapolis. People who had heard Jesus teach, had witnessed his miracles, and then saw him die on the cross, could also have said, "I don't believe it." But it was true; he was crucified and he hung there until he was dead. They couldn't believe it was happening; but they saw it with their own eyes. They knew that Jesus was dead. Now, suppose that the parking meter - while no one was looking - raised itself and set itself back in its original position, looking all new and perfect. And suppose this was reported to Molly, the parking lot attendant, the police officer, and the meter superintendent. "That's utter nonsense," all would declare. "It just couldn't happen." They might even say, "I don't believe my eyes! This just isn't real; it didn't really happen." Nor could a dead person rise from the grave after being crucified, declared dead, and had spent a couple of nights in a tomb. It is only natural that the disciples said, "We don't believe it. That's simply nonsense." There was no way that they were going to believe the women! They had to see for themselves, but that didn't happen on Easter morning. 1. How could such a thing happen to Jesus? He didn't deserve what he received at the hands of the religious and political professionals, did he? They crucified this man who had done nothing but good in his lifetime! This sort of thing still happens, we all know. The good just may "die young." 2. How could such a thing happen to Jesus? How in the world could he rise from the death slab and be alive again after almost three days in the tomb? The resurrection of Jesus compounds life's ultimate mystery - death. Resurrection? That's just plain nonsense, isn't it? 3. How can such a thing happen to us? Is there resurrection in our future? That's the promise of the gospel of our Lord, isn't it? Jesus said, "Because I live, you also shall live," eternally in the everlasting kingdom of God. Weren't we "marked with the cross forever" - the sign of resurrection and deliverance - in our baptism? 4. How can I believe in the message of the angels, "Why do you seek the living among the dead?" How can I believe that Jesus is the Lord, whom God raised up on the third day when all of the scientific evidence is against it? I know that a parking meter cannot raise itself from the sidewalk and make its own way back into an upright position. That's impossible. But Jesus? He was raised to a new level of existence and that's beyond the realm of scientific inquiry. It belongs to the field of faith. 5. So, listen to the message, ponder it, and allow the spirit of God to touch your heart and mind until you can say with all of your heart, soul, and mind, "It may not make scientific sense, but I believe the witnesses and the word. He does not lie among the dead! He is risen! He is risen, indeed!"